Tired of having to type in a password every time you want to log into Windows? Forgot Windows password and didn’t know how to get back on your computer? In this tutorial we’re going to show you how to bypass Windows 7/Vista/XP login screen and gain access to your computer without entering a password. How to Bypass Windows 7/Vista/XP Login Screen? If you’re the only person with access to your computer, you can have Windows boot straight to the Desktop without prompting you for a login password. It’s easy to bypass Windows login screen and the instructions below will show you how to do it. 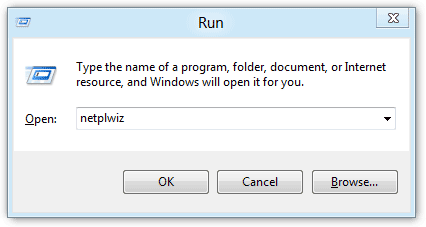 Step #1: Press Windows + R to open the Run command, type netplwiz or control userpasswords2 and press Enter. Step #2: Under the Users tab, uncheck the Users must enter a user name and password to use this computer option, click Ok. Step #3: Now enter the existing password in Automatically Log On dialog window, click OK, restart your Computer. You won’t be prompted to enter your password next time you turn on or restart your computer. Forgot Windows Password? How to Bypass Windows Login Screen? Step #1: Download the Reset Windows Password utility and save it on an alternate PC which you have full access to. Unzip the download file and you’ll get the ResetWindowsPwd.iso file. 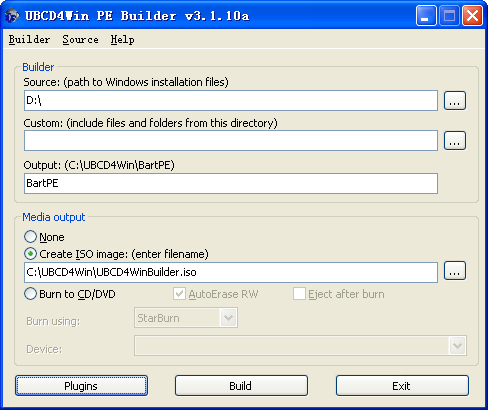 Burn the ISO image to an empty CD (or USB flash drive) using ISO2Disc program. Step #2: Simply insert the CD into your locked computer and restart it. You may have to call up the boot menu by pressing F12 or something, but it may automatically boot from the CD drive you inserted. Step #3: Once the computer boots up from the CD, it will open up the Reset Windows Password program. Select a user account and then click on “Reset Password” button. It will reset/remove your forgotten Windows login password instantly. Step #4: Remove the CD and restart the computer. Normally the computer will then boot directly into the Desktop without requiring you to enter a password. However, the Windows login screen might still appear even if you are using a blank password. If you’re that case, just press OK to log on your computer. 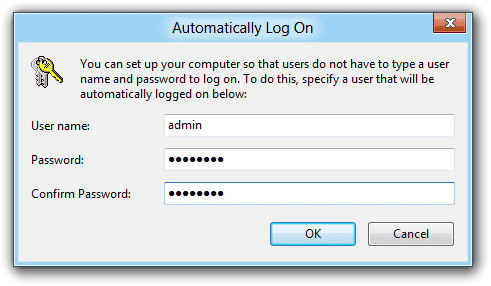 After getting into Windows, you can use the method above to enable automatic logon feature. I have forgotten the administrator password of my Windows 7 installation and locked out. Is there a way to reset or bypass the password? I do have physical access to the PC. Few things are more annoying than forgetting your Windows administrator password. Without your Windows password your PC is nothing more than a door stop. In this tutorial I’ll show you how to bypass Windows administrator password which will allow you to login to Windows once again. All you need to bypass Windows password with this method is another Windows PC so you can download the Reset Windows Password utility and make a password reset Live CD/USB drive. 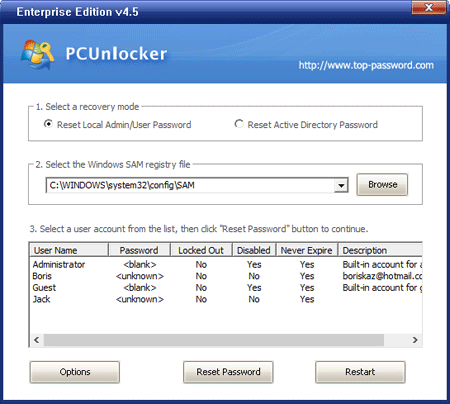 How to Bypass Windows Administrator Password? Take the Live CD you just created to the computer you want to hack. Insert the CD into the CD drive and turn on the computer. Normally, the BIOS screen tells you the keyboard key you need to press to change the boot order, watch for that message! On most computers the BIOS key is Del, F9 or F12 but yours might be different, so watch out for that on the boot-up menu. Choose the administrator account you want to bypass the password on and click on “Reset Password” button. It will remove your forgotten administrator password immediately. Remove the CD from the CD drive and restart the computer, you can then log into the administrator with an empty password. Done! This tutorial is fairly simple to follow even if you are not very techie person. With this trick you can bypass Windows administrator password on any version of Windows operating system, including Windows 8/7/Vista/XP. For most Windows users, forgetting the password to an administrator account can be devastating. Hacking your way into the computer is not always easy and trying to remember the password may not do you any good either. 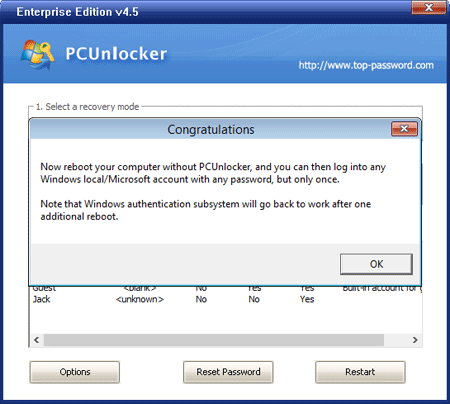 Luckily there is a powerful recovery software which allows you to bypass Windows 7/Vista/XP admin password in minutes. 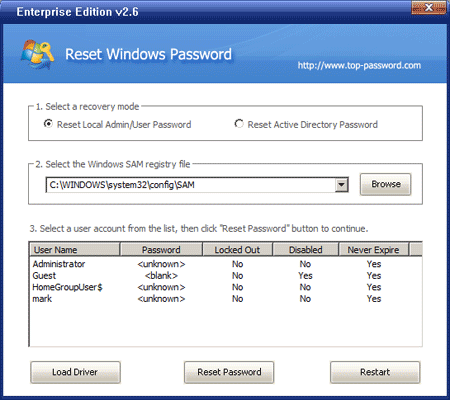 With Reset Windows Password utility you can bypass Windows admin password through booting your computer from a CD or USB drive. Quickly regain access to your locked computer when you forgot the administrator password. This method is a very simple one. You just need to download the software on an alternative computer, and create a bootable CD or USB drive. So you can then use it to boot your computer and remove the forgotten admin password easily. 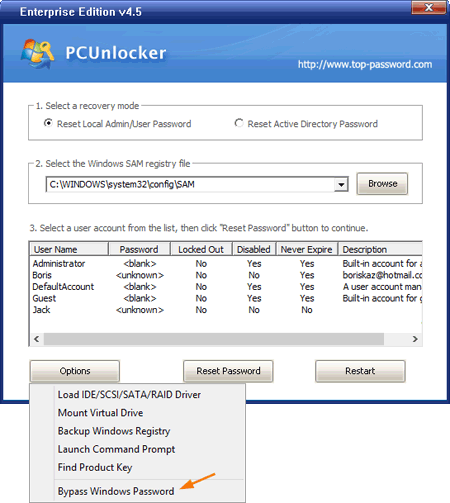 How to Bypass Windows 7/Vista/XP Admin Password? Insert the bootable CD/USB drive into the target computer with a forgotten administrator password. Power on the computer and set it to boot from CD or USB, not your local hard drive. 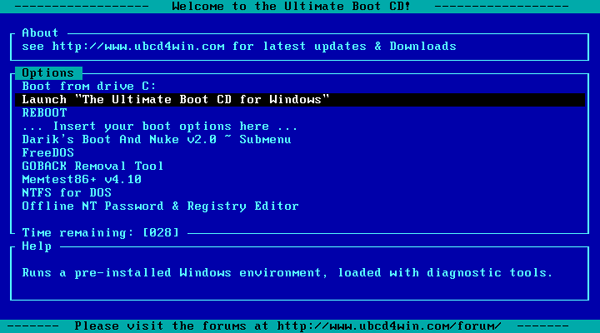 Shortly after loading the operating system inside the CD/USB drive, it will launch the Reset Windows Password program. You’ll see the Windows SAM registry hive and a list of Windows user accounts which are detected by the program. 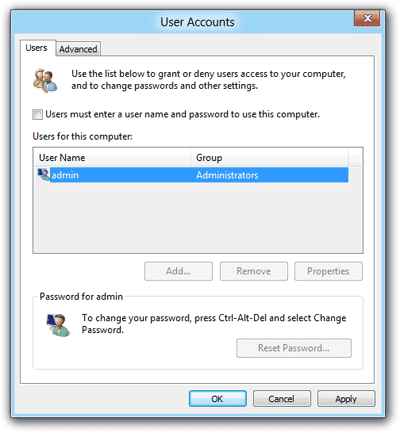 Choose the administrator account and then click on Reset Password button, it will remove your Windows administrator password immediately. Remove the bootable CD or USB drive. Restart the computer and you can then log in to your administrator account with a blank password. 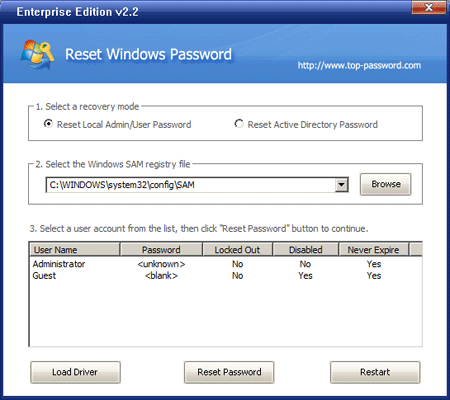 With Reset Windows Password utility you can also unlock any locked-out or disabled Windows accounts, and bypass domain administrator passwords on a domain controller. I think, this would be the perfect password recovery tool for both home and business users alike. Have you forgot your XP, Vista or Windows 7 logon password? Sure, there are a few workarounds to access your account using some password cracking software but they are time consuming and boring as you need to go through a long procedure. In this tutorial we’ll show you how to bypass Windows logon password in just 3 steps. The procedure is quick and easy. 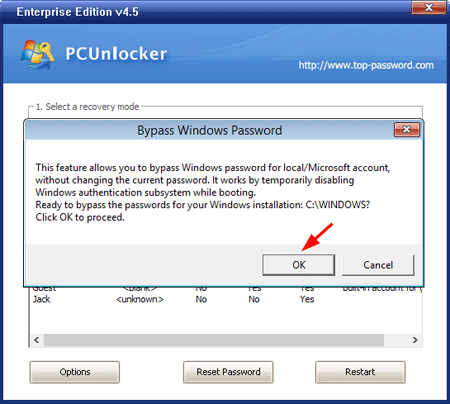 How to Bypass Windows Logon Password in 3 Steps? 1. Download the Reset Windows Password CD-ISO ZIP file (It’s about 28.1 Mb) and extract it to get the ISO file: ResetWindowsPwd.iso. Burn the ISO file to a CD/DVD to create a bootable CD/DVD. You can also burn the ISO on to a USB flash drive using ISO2Disc tool. 2. 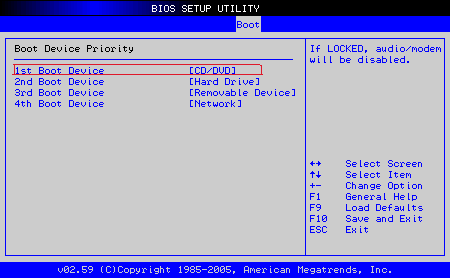 Before inserting the CD/DVD make sure that you have made necessary changes to boot priority setting in the BIOS so that you can boot from CD/DVD. Insert the CD/DVD into the optical drive and restart your machine. 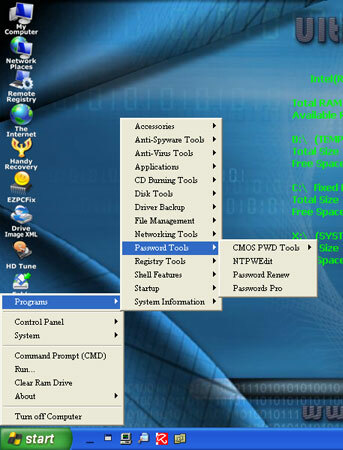 After a while you will see the following screen of Reset Windows Password utility. 3. Choose your Windows SAM registry file from the drop-down list, the program will display all user accounts inside the SAM file. Select an account and then click on the Reset Password button to remove your forgotten Windows logon password. Take out the CD/DVD and restart the computer, you can then log on to Windows with a blank password. That’s it!